Through his career as an actor, George Clooney has offered audiences with a well-to-do list of fine performances that bring to life vivid influential fictional and exciting non-fictional characters. There is no doubting that currently Clooney is a highly regarded, respected and powerful force within Hollywood. And thankfully his work as an actor has yet to be complete. It is in my humble opinion that Clooney, as a director, has excelled in the medium quicker than as an actor of his time. As a director, Clooney has elevated the mainstream storytelling technique as well as contributes to having a tremendous, natural execution of developing his characters, especially when it comes to telling the true stories of some of the most influential behind-the-scenes men that were born and raised in the United States. Clooney’s intent in his films is to preserve culture, history, and a way of life, bringing to life as well as sharing the many amazing stories of men (and women) who make him proud to call himself an American. From Chuck Barris, creator of the Gong Show and supposed CIA agent (played perfectly by Sam Rockwell) in Confessions of a Dangerous Mind; to Edward R. Murrow, the man responsible for the censure of Joseph McCarthy and McCarthyism (played gallantly by David Straitairn) in Good Night, and Good Luck; to Dodge Connelly, a mimic of Herald ‘Red’ Grange, an icon of American football (played by Clooney himself) in Leatherheads; to Senator Mike Morris (Clooney) in the political-thriller The Ides of March based loosely on the 2004 Democratic primary campaign of Howard Dean, Clooney has quite the knack for bringing to life the controversial stories of some great American men and their great patriotic accomplishments and failures. With The Monuments Men, Clooney finds hints of the potential essence that surrounded his greater directorial body of work, but unfortunately, falls into a formulaic routine that solidifies the film as a quasi-informative, melodramatic and somewhat predictable clichéd piece of American cheese. Bound to make its way into library halls and fall under the categories of ‘forgettable’ and ‘unaffecting’, The Monuments Men becomes an outdated artifact of recycled ideas that would see itself in the historical section of the museum collecting dust and being completely forgotten in the years to come. With scenes as predictable and numbered as the Dewey Decimal System, The Monuments Men is still a hard film not to like. Lead by a profound group of talented actors, the film tells the true life story of a small group of men who searched high and far through the immense rubble and destruction of the Second World War for the very fabric of humanity, culture and history. Lead by Frank Stokes (Clooney) and his hand-picked team of artists; James Granger (Matt Damon), Richard Campbell (Bill Murray), Walter Garfield (John Goodman), Jean Claude Clermont (Jean Dujardin), Donald Jefferies (Hugh Bonneville), Preston Savitz (Bob Balaban) and the young Sam Epstein (Dimitri Leonidas), the main objective for the men is to safely find, preserve and return famous and amateur art; art that Hitler was stealing with the intention of opening up his own museum. One of the biggest reoccurring elements throughout the film is the value of human life and the value of art. Clooney, throughout his narration, continuously makes clear that no artwork, no matter how valuable, is worth a human life. Yet, this statement seems somewhat impossible and disapproved during one of the most notorious wars in the history of world, responsible for countless casualties. Although stark and heart-warmingly affective, the narration by our protagonist serves as some of the films most thought-provoking segments of the film, yet takes away from the actions depicted on screen. The narration instead serves as an almost ‘in case you missed it’ captioning to the often times laughable and overly-comedic action on screen. Like with any Clooney directed feature, he is always able to round out a talented and multi-faceted cast that sometimes drive the stale action and narration itself. Comedians Bill Murray, John Goodman, Bob Balaban, as well as recent Oscar winner Dujardin, deliver an abundance of unneeded comedic relief that often takes away from the heavy subject matter and serious drama the film is attempting to sculpt. Finding the humour and humanity of a war that didn’t seem to have much during its occurrence, The Monuments Men is a light-hearted take on a solemn historical piece of time. Having the only female lead in the film, Cate Blanchett proves here more than anywhere, even amidst all the comedy and juvenile goofiness, that she is next in line to be our generation’s Meryl Streep. Camouflaging herself in her French accent and wholly Parisian character, Blanchett is one of the film’s saving graces. The other, as always, is the charm and bravado of the always impressive Matt Damon. Although mocked throughout the film for his horrendous French accent (now that was funny), Damon allows the imperfections of his depiction of a very real American solider to navigate through the progression of the story’s conflict with ease. His scenes end up becoming the crucial developments for his company of men, whereas most of the other characters rely heavily on luck and good fortune. Like any good historical heist film, there is always a ‘madonna’ to be found and retrieved, and more explicitly than most caper films, the ‘madonna’ here becomes, not only a psychical object, but represents the successes and accomplishments of the American people. In Clooney’s earlier directing work, so much of what was seen on screen had to do with America being victorious in their sometimes unorthodox game-plan. In Good Night, and Good Luck, Clooney shows the victory of the American people through the actions of a revered man, a man of character and perseverance, journalist Edward R. Murrow. And yet, the American flag was never waved or exuberantly presented and flaunted on screen to signify victory. In his last two features, Clooney presents the American flag in a piggish distasteful manner, and its tacky execution really allows audience members of non-American decent to be complexly aware of America’s in-your-face recognition of hubris. Thankfully, the film opted for a February released as opposed to its originally planned late December, awards-run release. The film is by no means an Oscar contending film, but then again, Bad Grandpa is nominated this year for an Oscar, so the value of that sentence can really be questioned. The Monuments Men is a satisfying tale, although short in depth, of telling the tremendous story of the brave American men who put their lives at risk for some of the most defining pieces of art we will ever know. The film is by no means a monument of Clooney’s directing career, sharing a very familiar potion to his slapstick, goof-ball comedy Leatherheads. Instead, The Monuments Men remains to be an enjoyable piece of American history, with a very small payoff, that is by no means monumental. Night Film Reviews: 6.5 our of 10 Stars. 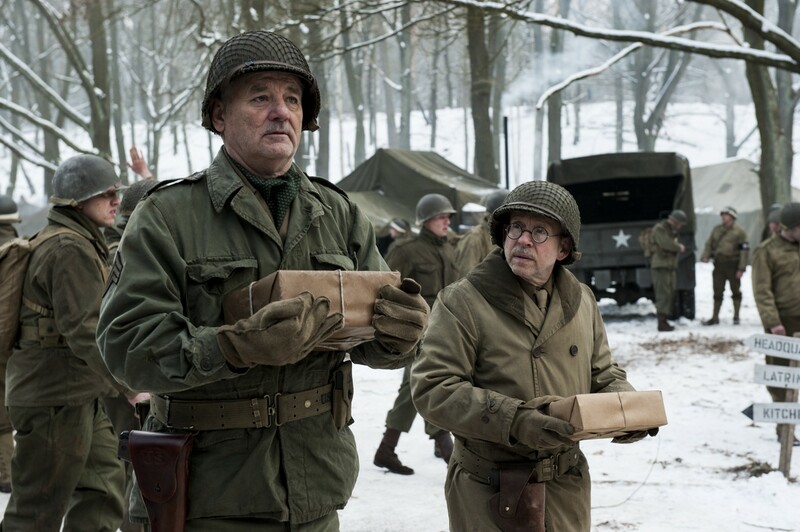 Should The Monuments Men have stayed with its late December release date and tried its luck at Oscar glory, or was the film wise by changing it release to February? Is the film a serious award contender that can hold-off for Oscar love come 2015? Does George Clooney deliver? Leave your fine thoughts and comments below and let us know what you think. 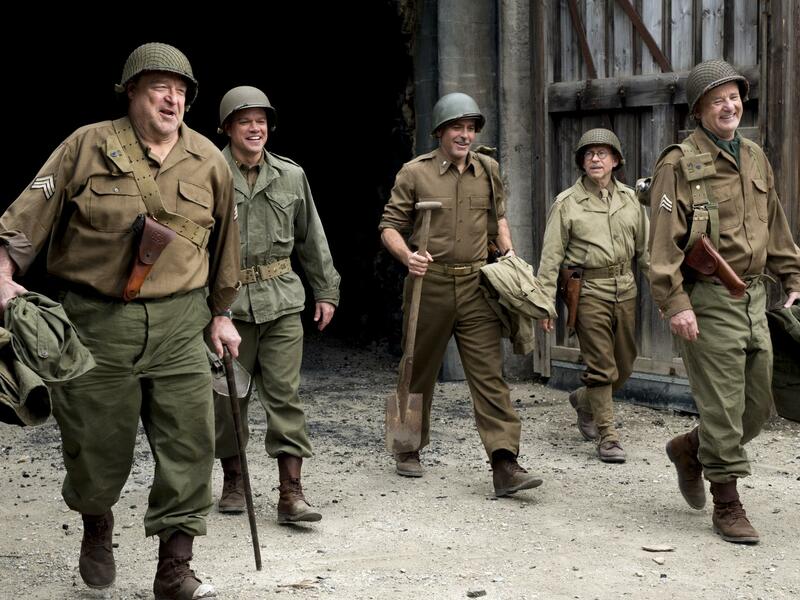 This entry was posted in Reviews and tagged Bill Murray, Bob Balaban, Cate Blanchett, Dimitri Leonidas, George Clooney, Grant Heslov, Hugh Bonneville, Jean Dujardin, John Goodman, Matt Damon, The Monuments Men. Bookmark the permalink. I am just waiting for a program here on Sicilian TV “Che Tempo Che Fa” because George Clooney, Matt Damon and Jean Dujarding will be interviewed about this movie.